Walter "Walt" Whitman (May 31, 1819 – March 26, 1892) was an American poet, essayist and journalist. He was an important American poet of the 19th century. His most famous collection of poems is Leaves of Grass, which was first published in 1855 with his own money. The work was an attempt at reaching out to the common person. Whitman kept adding to this book right up until he died of pneumonia, in 1892. It was controversial because readers thought it was obscene. It included some sexuality. Whitman was either bisexual or homosexual. However, there is disagreement about whether Whitman had actual sexual experiences with men. Whitman was deeply influenced by deism. He denied any one faith was more important than another, and embraced all religions equally. Whitman first tried writing in many different popular genres. In 1850, he began writing Leaves of Grass, a collection of poetry which he would continue working on until his death. Whitman wanted to write an epic that was clearly American, using free verse. At the end of June 1855, Whitman surprised his brothers with the first copies of Leaves of Grass. His brother George "didn't think it worth reading". Whitman paid for the publication of the first version of Leaves of Grass himself and had it printed at a local print shop. A total of 795 copies were printed. The first page was an image of Whitman, but he doesn't write his name until 500 lines into the body of the text. Ralph Waldo Emerson wrote a kind five-page letter to Whitman and praised the book to friends. The first edition of Leaves of Grass was very popular, but was some people didn't like the "obscene" or offensive parts of the poetry. In the months after the first edition of Leaves of Grass, people became more upset about the sexual themes. Because of this, the publisher almost did not release the second edition. In 1856, 20 new poems were added. 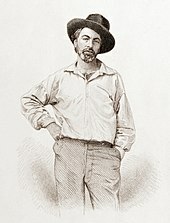 Different versions of Leaves of Grass continued to be published throughout the rest of Whitman's life. Many famous writers like Amos Bronson Alcott and Henry David Thoreau liked the work enough to visit Whitman. ↑ "[Review of Leaves of Grass (1855)]". The Walt Whitman Archive. This page was last changed on 8 December 2018, at 19:34.